Summary: We robust and well designed Outdoor spotlight system, the Lily spotlights are well made with a color bulb built in, they can be fixed to a wall or ground, or into flowerbeds with the included spikes. A great addition to your garden if you already have Hue set up in your home. 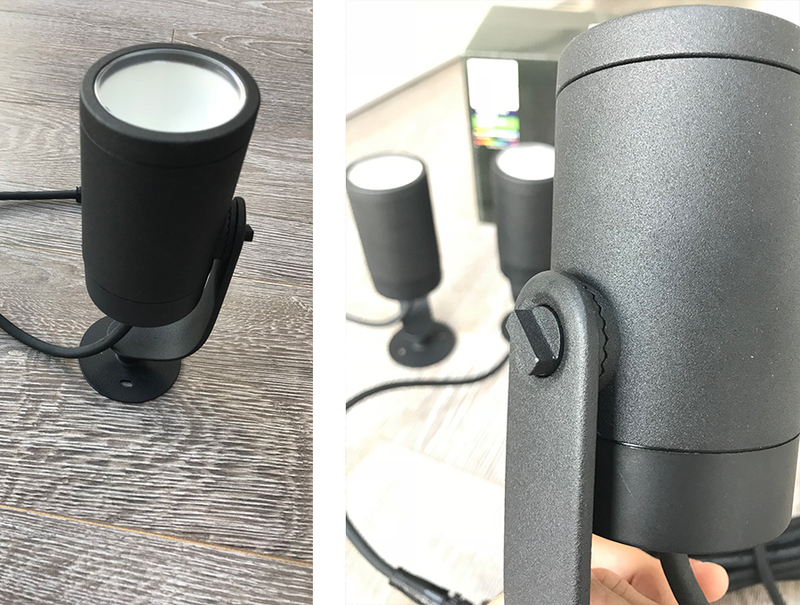 Spotlights are a great way to illuminate certain areas or focal points, the Hue outdoor Lily spotlights are perfect for the garden allowing you to install in the ground or to a wall. With the integrated color bulbs you can set the mood or add a splash of color to a wall in your garden. The Philips Hue Outdoor Lily Spotlight is sleek looking garden light that is perfect for creating mood lighting in the garden and lighting up certain areas. 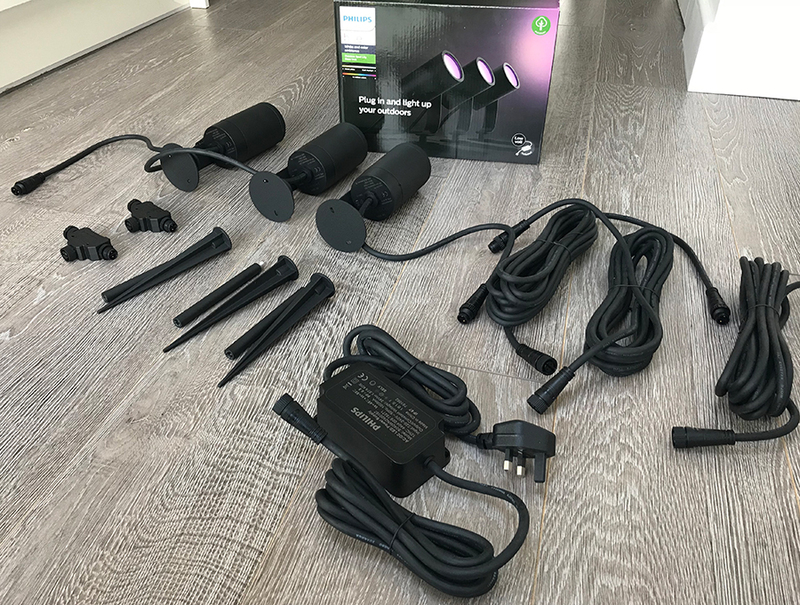 Coming in a large box, the parts of the Hue Lily lights are well packaged, within you get 4 boxes, 3 boxes with a spotlight in each along with the spike for that light, and then the larger box has the power unit and cables in. In this set you get 3 Lily spots, these are aluminium sleek looking spotlights designed for the outdoors. The lights are sealed and there is no way to access the bulb. That being said you can see the bulb from the top of the light, this isn’t a normal Hue GU10 color bulb, the bulb is designed and built into the light. If there was an issue i doubt you can just replace the bulb. The lights work seamlessly with other Hue lights and the Hue app, they are added exactly the same as other Hue bulbs, can be picked up and then added, once added you can change the color of them, turn them on and off, change the brightness and set timers for them too. It is important to note that the bulbs are all controllable separately and individually, of course they can be added to a garden group, however you can still make each bulb a different color as you can with indoor Hue bulbs too. The spotlights can be wall mounted or installed into the ground with a spike, both attachments and fittings are included. Out of the box the lights have the base plate attached allowing you to screw it to the wall, or ground, this just screws on. There is then the spike fitting, this can be installed so the spotlight is close to the ground, or you can install with the extension pole that will make it higher. The lights come with a good length of cable too which is certainly a good thing, the more the better. Between each spotlight you use a 5m long cable, these are attached in a daisy chain style, you can connect up to 5 lights in total in this method. From here it is connected to the main plug transformer, the length of cable for this is 2.9m. 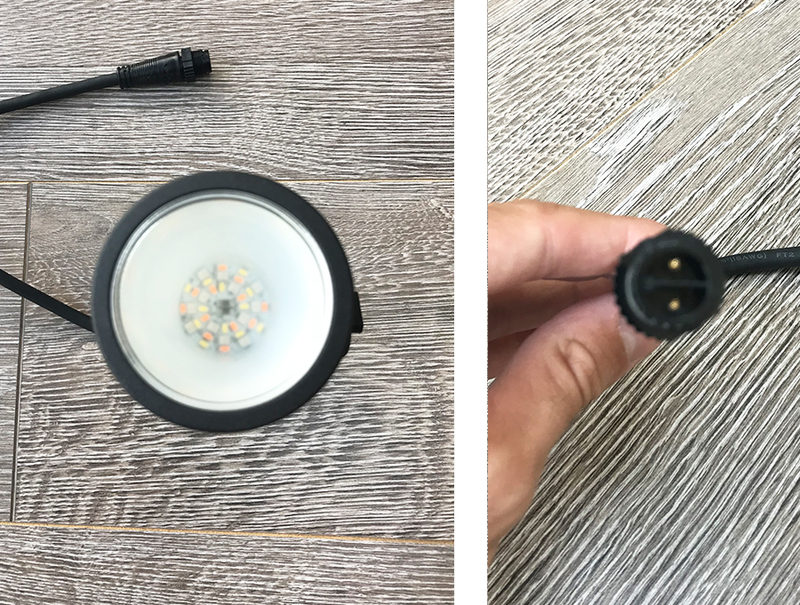 The cables are very well made and very robust, the connectors that join the cables together and to the 3 way connector are very well constructed, made from plastic they work well and are designed to ensure no water gets in. The 3 way connector block comes with a cap incase you don’t use it to extend any further preventing water touching the connectors there. As you can see from the image above, the lights are adjustable, they can be pointed upright, or pointed back or forth, the screw adjuster on the side allows to to adjust and then tighten preventing the light from moving position or dropping down. This feels we built and doesn’t feel cheaply made, a solid fixing that seems very robust. Unlike other Hue lights this comes with a hefty and heavy power transformer block, there are holes in it to allow you to screw down if you wish. 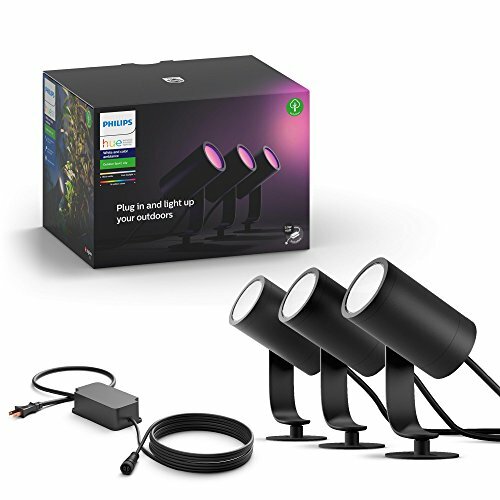 These lights do not come with a Hue Bridge, if you don’t already have Hue lights set up in your home then you must buy a Hue bridge to use these lights to there maximum allowing you to change the colors and dim them. It must be noted that you should not connect more than 5 lights (be it the Hue Calla or Hue Lily) to the same power circuit. Also the cable may not exceed 35m in length. These are very sleek and stylish, they look great and work really well, seamlessly fitting into the Hue eco system and working perfectly with other Philips Hue lights be indoors or out. From a quality and style opinion you cannot fault them, they are well built, look great and work really well. The downside is price, they are not cheap, you could buy outdoor lights like these that have enough room for color Hue bulb, the cost of those and the Hue GU10 bulbs would work out cheaper than this package. For an out of the box solution for your garden though this is great, its just not cheap but if you already have a range of other hue bulbs in your home then you probably didn’t expect it to be. That being said they are very well made, very robust and look great. If you are looking for some garden lights, a way to light up certain areas of your garden, a garden ornament or plants then these are great, the ability to add color can change the mood and style of your garden. I’m interested in these lights however how wide is the light that comes from the fixture ? Is it a narrow beam or wide beam of light? I would say it is like a normal spotlight, it certainly isn’t narrow. I have just bought two sets of these because I want to light the front of my house. Would you think that they are bright enough to throw a wide beam from around 4 metres? 4 metres maybe a bit too much for a good wide beam, maybe best to set up and test to find the best distance and placement for them. Hmmmm… Lily and Calle each have 600 Lumens. The Philips Hue GU10 Bulbs only produce 300 Lumens. So although you might be able to refit landscape lights that use GU10 bulbs with the HUE Color GU10…they wont be as bright as the Lily an Calle.